Unfortunately time constraints (i.e my day job) keep getting in the way of me updating this site so all Ive been able to do so far for the Oldham Athletic Nickname page is a very basic bit of background. 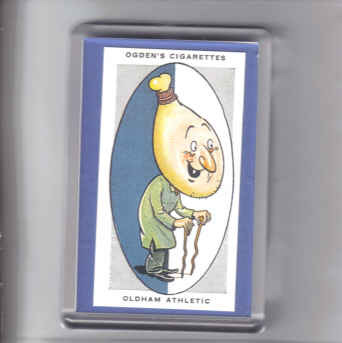 Ive shown below a football cigarette card from the Ogdens AFC Nicknames series that shows a caricature that depicts an "Old Ham", which of course a play on the teams name !! "Known locally as the “Latics” and depicted as a Ham, Oldham Athletics nickname is simply a play on the title “Athletic”. One of the youngest of Lancashires League clubs they were admitted to the Second Division in season 1907-08 and were remarkably successful, attaining senior rank after serving an apprenticeship of only three years. They flourished, too, for a time in the top class, but in season 1922-23 they were relegated to the Second Division and since then have not been able to rise above it. As a comparatively young club, conditions in recent years have been seriously against them, but with happier times in view the prospects are encouraging.". By the way, the actual cigarette card shown above is enclosed in a clear fridge magnet, just one of the Oldham products we have on this site.